When it comes to the most shipped smartphone in Q3 of 2017 it was the year-old iPhone 7 from Apple. Whereas, the iPhone 8 Plus out-ships iPhone 8 in Q3 2017. Research firm Canalys has said in a report that Apple's iPhone 7 was the world's best-shipping smartphone the third quarter of 2017. Around 13.0 million units of the iPhone 7 were shipped over the period. As per Canalys data, the iPhone 6 took the second position with 7.9 million units shipped and Samsung Galaxy J2 Prime was the third position with 7.8 million units shipped. Meanwhile, Oppo also performed well and took the fourth and fifth positions on the list, with 7.8 million and 7.2 million units of the the A57 and R11, respectively, being shipped. Launched in mid-September, Apple iPhone 8 didn't make it to the top five in the list. 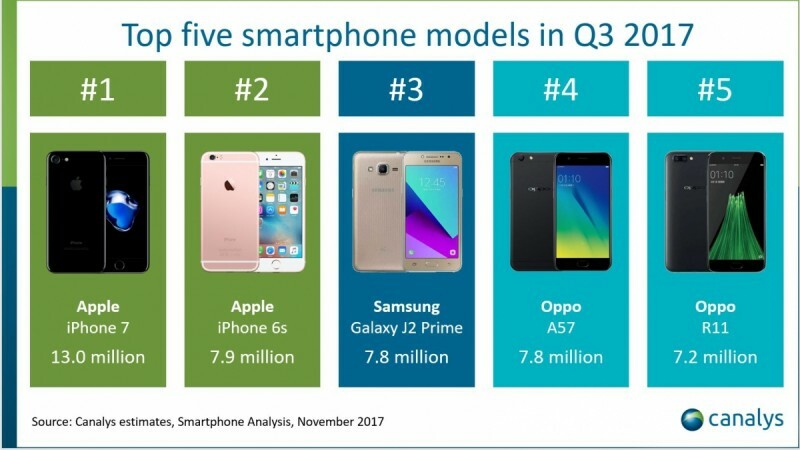 Canalys' numbers suggested about the iPhone 8 series that the iPhone 8 accounted for only 11.8 million units in the quarter, whereas the iPhone 7 had hit 14 million smartphone shipments in its very first quarter. Apple shipped around 46.7 million smartphones in the third quarter of 2017, out of which 11.8 million were iPhone 8 and iPhone 8 Plus — approximately 5.4 million units and 6.3 million units, respectively. This makes the iPhone 8 Plus the first iPhone Plus model to out-ship its smaller variant in a single quarter. "Shipments of older devices, such as the iPhone 6s and SE, saw an uptick in Q3," said Canalys analyst Ben Stanton. He added that the iPhone 7 received strong shipments after its price cut in September. "Apple grew in Q3, but it was these older, cheaper models that propped up total iPhone shipments. Apple is clearly making a portfolio play here," he said. However, Samsung remains on the top of the smartphone vendor list. In Q3 Samsung shipped 82.8 million smartphone, all thanks to the growth of its J-series, which did well particularly in Indian and the Middle East. Samsung Galaxy Note 8 saw shipments of 4.4 million units and the Galaxy S8 saw 10.3 million units shipped, the Canalys report said, noting that this was due to the discounted pricing. 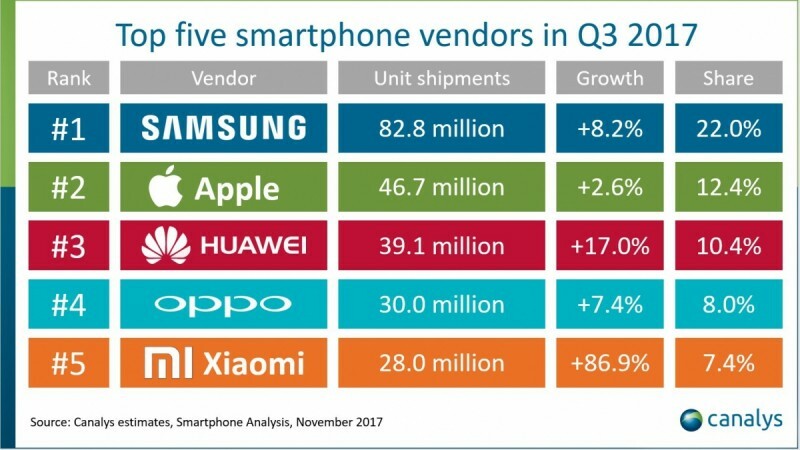 When it comes to the top five individual vendors, is Apple in the second position, Huawei at number three and Oppo and Xiaomi at four and five respectively. Xiaomi saw an 86 percent growth with 28 million smartphones shipped.